Close up of the above: the carbon fibers are clearly visible. They are the last material to be cleared out of the nozzle. 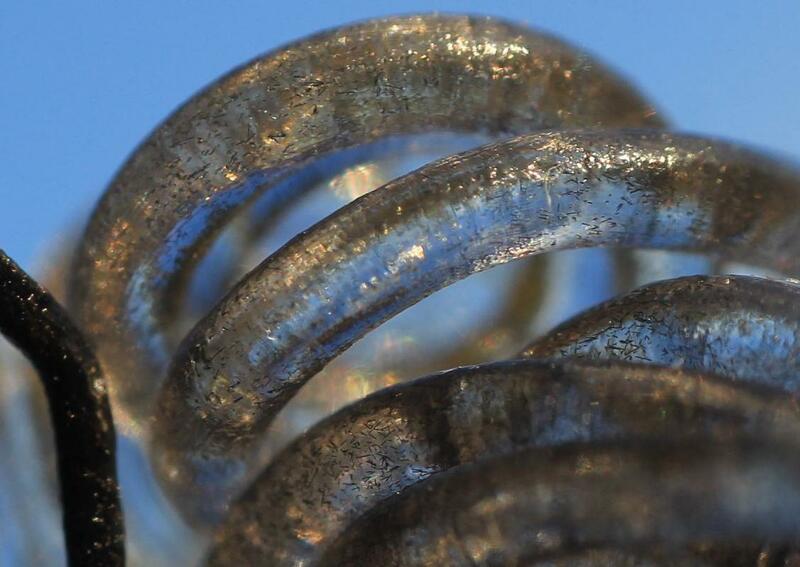 The use of clear polycarbonate gives interesting clues about filament transition. Let me first say that I firmly believe it depends on the materials themselves (mostly viscosity), but also a lot on the internal shape of the nozzle, and finally on the extrusion speed. Shear, backpressure, viscoelasticity and so all play a role. And when two different materials are mixed, you get a super tricky soup! :) Hence, polycarbonate introduces a high bias in the experiment, as much as starting with CFPLA. But still... See the picture below: the black filament is being smoothly replaced from the outside towards the inside! That is, the polycarbonate first surrounds the existing black CFPLA by flowing on the outer of the nozzle first, and it then drags the remaining within. Weird! Weirdly, the extruded polycarbonate replaced CFPLA from the outer towards the inner! I would naively have expected it to be the other way: the new material would first be extruded "in the middle of" the existing one, and then it would purge the previous one by dragging it in an expanding cone-shaped thread. 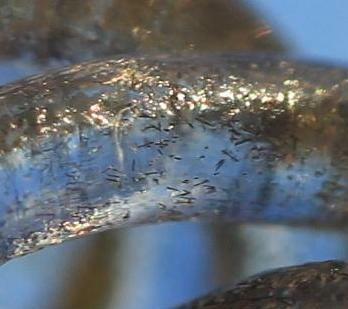 The last bits of black "ought" to be on the surface of the clear(ed) thread, not the opposite as above. My only guess for the above picture is that the polycarbonate in contact with the metal may flow better than the one which is surrounded by molten plastic (in the middle). So even though there is a larger friction on the internal walls of the nozzle, the resulting drag is lower than that of the additional viscosity due to the lower temperature in the middle of the molten filament? In the picture above I was pushing hard to squeeze the CFPLA faster out of the nozzle. No filaments are visible by the way. Reciprocally, in the first picture of the post, the extrusion rate was much slower, and the tiny carbon fibers are left behind as the last material to be dragged out. By the way, this is yet another interesting phenomenon: solid particles seems to be the last one to get out of the nozzle, and sometimes with a significant delay. It matches my impression that a significant additional length of the new material usually has to be extruded before I can trust that my nozzles are purged enough and clean from dirt. For some reason it reminds me how the heaviest grains of sand accumulate on the surface of a bucket when it gets shaken. Though the physics are probably quite different (i.e. particles vs. fluids). What about other materials? I have no clue. Yet another picture below: I do like the "atomic" feeling of the following transition to an opaque flashy ABS (the picture is taken from this old review about various printable materials). Even though it does not show the effect as much as with polycarbonate, we see patches of CFPLA on the surface -at least- of the ABS during the transition, which seems to match the first effect of this post (and not the previous one). surface during the transition. It looks like the first picture on the post, not the latter. So what? Is this just curiosity or are there ideas? More experiments are certainly needed to get better clues of the physics behind. 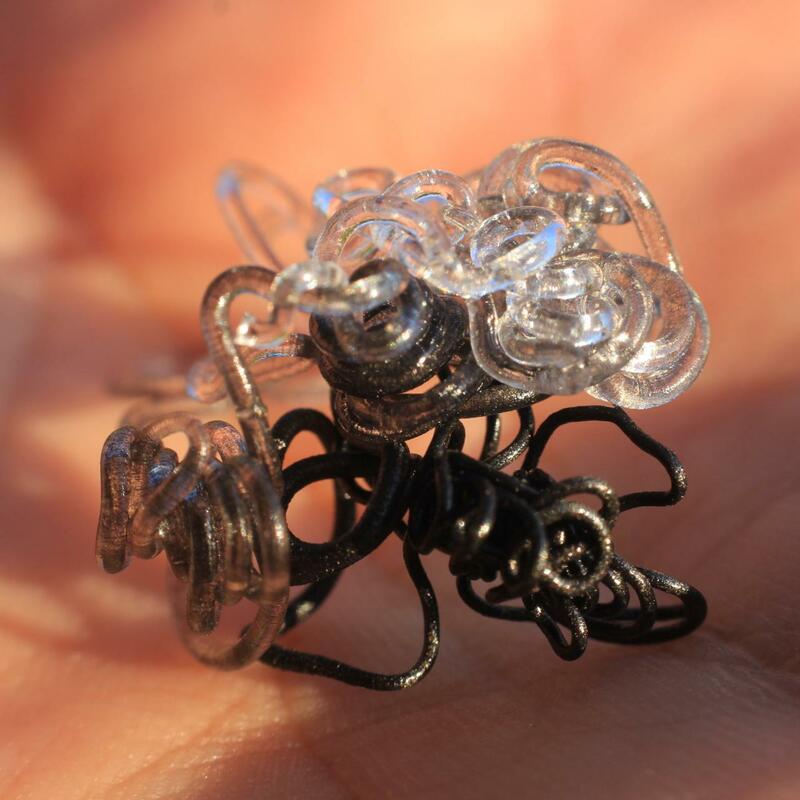 But this is more than just another "weird" post that shows that extrusion is a particularly complex process. The study of flow and forces and within fluids, namely fluid mechanics, will keep me puzzled as now! Anyhow, dual extrusion printers often circumvent the issue by using a purge tower. This works fine because it ensures that enough material is being extruded (and lost) before it starts printing with the other material. There is a large room for optimization there though, depending on materials and how the switch is done. E.g. it could be beneficial to extrude more slowly or at different temperatures for the transition, etc. Here is the original tiny sample in the palm of my hand.